The Sound of Steam in the Sulgrave landscape……. Until I was well into my twenties, the sounds and smells of steam locomotives hauling passenger and freight trains on the former Great Central Railway over the embankment to the east of the village were regular occurrences; so regular, in fact, that no-one paid any heed to them. The distinctive sound of these engines is so ingrained in my consciousness that even now, when following the bridleway to Weston on foot, I have a nagging feeling that something is missing and then I remember what it is! 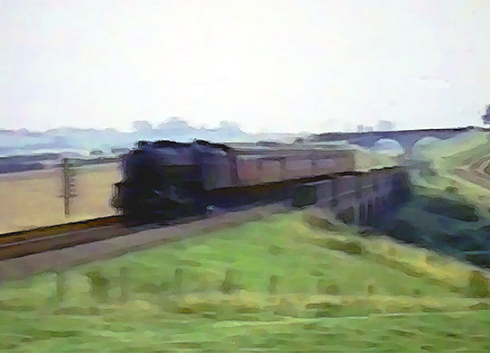 Visitors to the website will recall an article by villager Chris Behan a couple of months ago featuring the “South Yorkshireman Express” which regularly used this line between Bradford and London. Chris is currently doing some research on the 17 (sic) railway stations which were once within easy reach of Sulgrave with a view to a further article. In the course of this work he chanced upon a film made in the early 1960s depicting the Great Central Railway in its twilight years. Click here to see (and hear!) this film. The local landscape through which the train passes will be familiar to all villagers, especially the still existing landmarks of Peter’s Bridge and the Helmdon Viaduct. I am very grateful to Chris for submitting this little production, which is particularly nostalgic to me since, every Saturday during my early teens, I walked to Helmdon to get the train to the Brackley “top station” shown in the film and from there walked to school in the centre of the town. This entry was posted on Monday, March 28th, 2016 at 10:32 am	and is filed under News. You can follow any responses to this entry through the RSS 2.0 feed. You can leave a response, or trackback from your own site. Brings back memories of going to meet grandmother from Brackley Top Station in the fifties. Also going to Helmdon to collect coal from Mr Peart .